MS-UK is a charity that empowers people affected by multiple sclerosis (MS) to make the most of today and live life to the full. 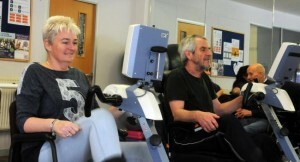 We run a number of services including a wellness centre, Josephs Court, based in Colchester, Essex which provides tailored exercise programmes using specialised exercise equipment as well as social activities for people with MS. Ultimately we aim to support people to improve their health and wellbeing and maintain their independence. We have been fortunate to have the ongoing support of Colchester Catalyst Charity which has allowed us to provide much of what we do at Josephs Court. Over the years, they have supported us with grants to allow us to purchase some of the specialised exercise equipment that is so vital to supporting our clients. When we were looking at our plans to secure the long-term sustainability of Josephs Court, Rodney Appleyard at Colchester Catalyst Charity put us in touch with the regional representative at Big Lottery. Following an initial planning meeting it became apparent that we needed to pilot opening evenings and weekends and use this pilot to inform any application we wanted to submit. Colchester Catalyst supported us by match-funding the pilot. Over a nine month period we were able to offer our services four evenings a week and on Saturdays. During this time we learnt lots about these times – including how they needed to be staffed and what hours did and didn’t work for people. This learning not only informed the finer details of the application we later submitted to Big Lottery, but also enabled us to demonstrate a reliable track record in these wider opening times. One year on, and we are very pleased to say that, with grateful thanks to Colchester Catalyst’s generous support, we have secured £500,000 funding from the Big Lottery over the next five years!